Oval diamond engagement rings are a beautiful choice for couples interested in a classic engagement ring design with both vintage and modern appeal. There is a range of styles and setting types, but couples will also want to consider the unique aspects of an oval diamond before making their decision. Despite their similarity to round shapes and their growing popularity, it can be difficult to find oval diamond engagement rings, particularly as diamond solitaires. Mark Broumand: This jeweler carries oval diamond rings in modern as well as antique designs. Find settings such as solitaires, three stone and pave. 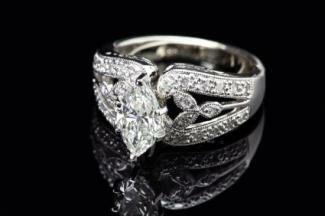 Diamond Ring Forever: This site has oval diamond rings set in metals such as yellow and white gold as well as platinum. 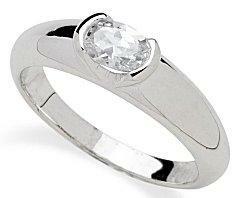 Blue Nile: This retailer features oval diamonds done in a halo setting in your choice of metals. Tiffany & Co.: This luxury jeweler carries solitaire and three stone oval diamond rings. Solomon Brothers: This site carries a variety of oval diamond rings in styles that range from simple to elaborate. Lumera Diamonds: Offering GIA certified diamonds, this store also has charts specifically for oval diamonds to help consumers understand the quality of their selected stone. Excel Diamonds: This store offers a money-back gurantee, and has an easy-to-browse guide that shows the different parts of the diamond's grade along with the cost. James Allen: With an inventory of hundreds of oval diamonds, there is plenty of selection at James Allen. A great feature of this store is that it has actual pictures of the diamonds to help you make your selection. Three stone engagement rings that use graduated ovals or similarly sized gems. Rings with multiple accents such as a trio of small round diamond chips or larger pear shapes or trilliant side stones. Non-faceted oval stones such as opals, turquoise, and other unusual gemstones. Split shank diamond rings that help balance the longer stone shape. Textured engagement ring mountings that swirl the ring's band around the center stone to accentuate its unusual shape. The oval may seem like a truly antique option, but in fact, it is a relatively new diamond shape, only perfected in the 1960s by Lazare Kaplan. At the same time, however, the oval is so similar to the popular round brilliant shape that it immediately became favored by discerning brides-to-be, which has led to many grandmothers passing on oval shaped heirloom engagement rings to younger generations. 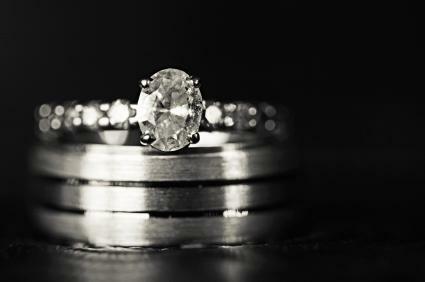 Today, oval shapes are once again growing in popularity and can be found in different ring styles and designs to suit any couple's preferences. An oval diamond has 56 facets: slightly fewer than the round brilliant diamond shape, which makes it slightly less sparkly. Because of the elongated shape, oval diamonds can have a bow-tie shadow effect in their interior reflections, though a well cut oval diamond will have only a small, barely noticeable shadow. The traditional length-to-width ratio for a perfectly proportioned oval is between 1.3 and 1.6, though the precise shape of the gem is largely determined by personal preference - some couples prefer a lengthier oval, while others want a diamond with a thicker appearance. Because of the fewer facets and the elongated shape, exceptional diamond color and clarity is crucial for a beautiful oval stone. Flaws and inclusions are more visible in this shape and a high quality stone will have fewer noticeable blemishes. Oval diamond engagement rings are stunningly beautiful options that help elongate fingers and emphasize the center stone without losing the classic feel of a vintage diamond shape. With many options available for different styles and alternative gemstones, oval rings are becoming increasingly popular with brides-to-be.